She Builds Her Home: Mary or Martha? So, so often, I am running around trying to get everything done and make everything perfect. I am washing clothes, doing dishes, fixing meals, driving little people around, vacuuming, meal planning, grocery shopping, running to the bank....I'm sure you know the feeling. Sometimes I feel as though if I take just a little time off, my whole world would explode. Everything would fall apart because I would get behind. It is hard to imagine just sitting around and doing nothing, which is how Martha saw Mary. But Mary certainly wasn't doing nothing. She was doing, as Jesus tells us, the most important thing. 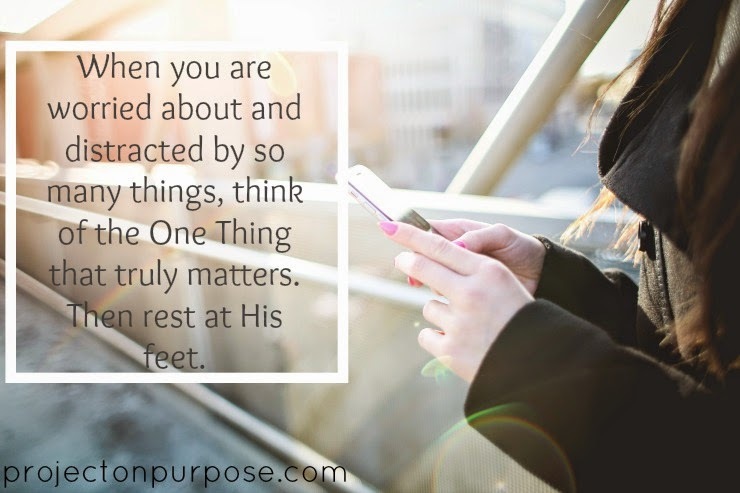 Read more at Project: On Purpose!